I went out to East Hampton last weekend and since it was rainy and gray as I was packing, and since it was the first day of fall, like any reasonable person I grabbed things like heavy sweatpants and flannel shirts for what I anticipated would be a damp and chilly couple of days. Except I should have known that the weather never follows the calendar (especially these days, despite what Rick Perry might have you believe), and when I woke up on Saturday morning it was warm and muggy, with the kind of murky sunshine that makes you feel warmer still. So scratch the long sleeved Henleys and heavy socks — this would be a shorts and t-shirts kind of weekend. And forget that ham and white bean soup I’d been planning to make. Summer might be over in the official sense, but the humidity and the fractured sunlight said it was too early for a bowl of hot-anything. 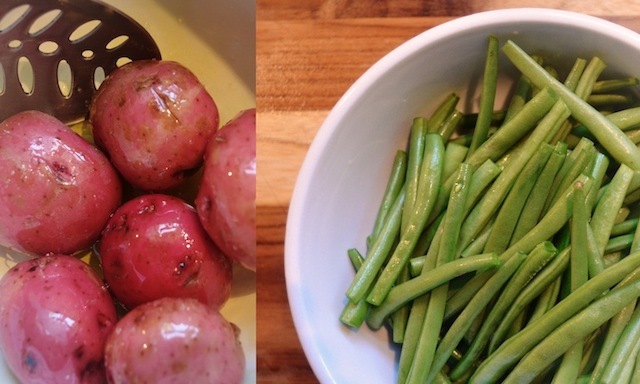 It would be one last weekend of summer food, if of the late-summer variety. 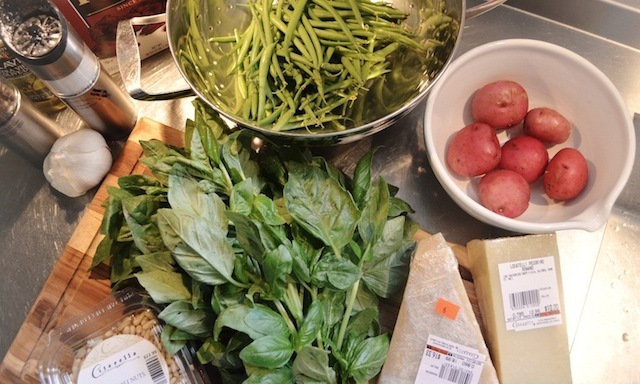 Which brings me to this week’s recipe, for something called trenette al pesto (or trenette with pesto, green beans, and potatoes), which I found in the August/September issue of Saveur. According to the magazine, the dish is a Genoese classic, with trenette being that region’s version of fettucine. I’ve never been to Genoa, but with the dish’s simple layering of vegetables over pesto-coated pasta, it seemed appropriately hardy for this northern Italian port city — I mean, potatoes and pasta? Really? You can do that? It also seemed to strike the right note for the weekend, satisfying my desire for something with seasonally appropriate heft, but that was still in tune with the Manila-like conditions outside. I also loved that I’d get to call into action the basil I’ve been trying to grow all summer. 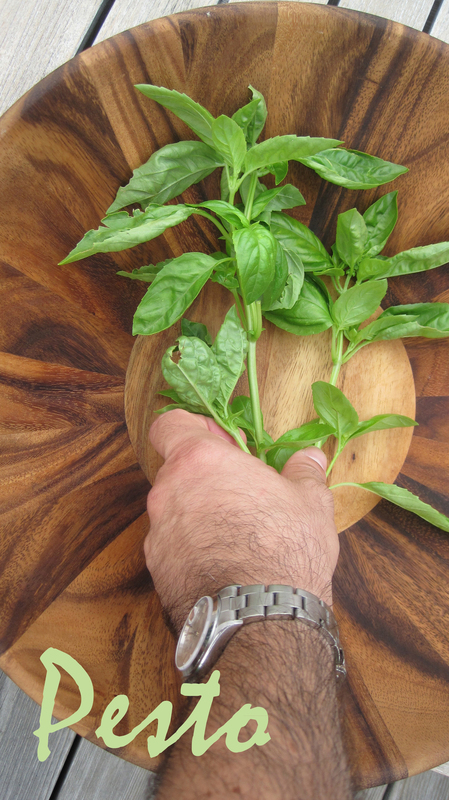 The recipe calls for 3 cups of packed basil, and while I doubted my sad looking basil plant could produce that much (it’s been a rainy couple of months here) I figured I’d strip it bare, then fill out the balance by hitting the local farm-stands, or even the market if necessary. By the way, if you’re looking for an appropriate send off for summer, let me suggest holding a large bunch of basil close to your nose. I did just that as I pulled the juicy leaves from the stems, and it smelled sweet and wet, not unlike damp earth — a scent I tried hard to record given the months of dried herbs that lie ahead. 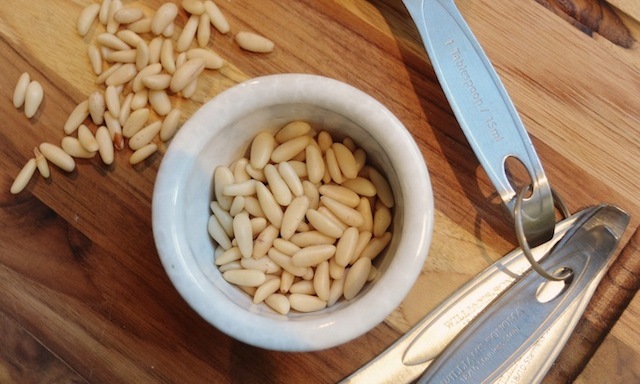 I love basil, just as I love everything that goes into a pesto — those slick little pine nuts, the olive oil, the garlic, the parmesan cheese . . . especially the parmesan cheese. 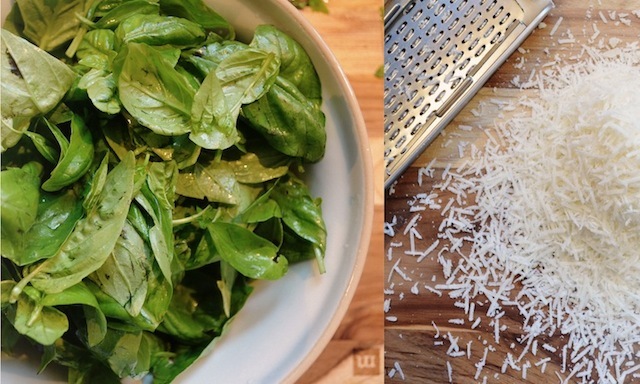 This pesto has the added bonus of some grated pecorino as well, a bit of salty tang that’s always welcome as far as I’m concerned. Given how much I like everything that goes into pesto — given how much I like pesto itself — it’s odd that I make it so rarely. In fact, as I loaded all of the ingredients into the bowl of my food processor, I couldn’t recall the last time I’d made fresh pesto. 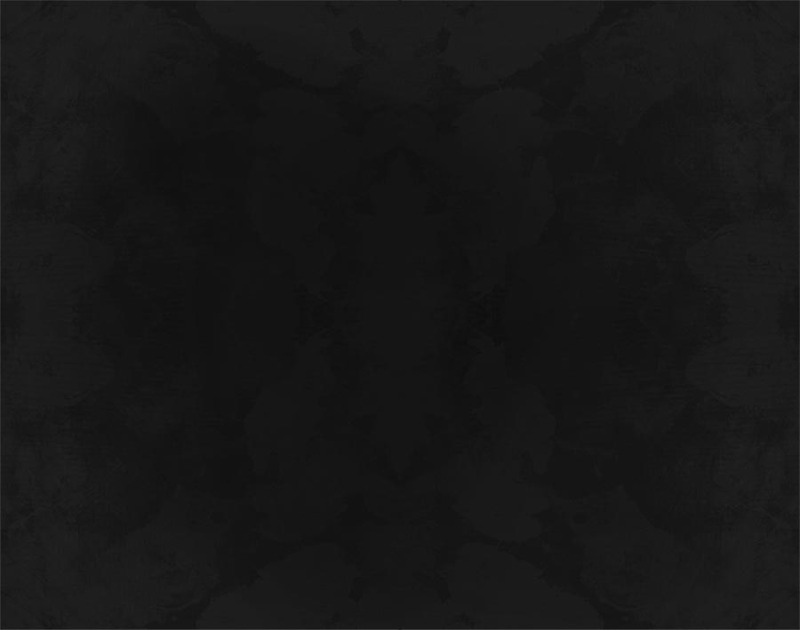 My loss, because the payoff is huge. It looks gorgeous, like new grass after it rains, and it tastes even better. It’s easy, too. Just give the whole thing a whir in the food processor (traditionalists believe a mortar and pestle is the only way to go), season with a little salt and pepper, and you’re in business. The remaining steps are just as easy. There are those red potatoes to prepare, which is simply a matter of tossing them with some olive oil, sprinkling them with coarse salt, and sliding them into the oven for a half hour or so (Saveur doesn’t offer instructions for this but mine are below). As for the pasta, if you’re using the dried variety you’ll want to cook this halfway to al dente (about 5 minutes) then add the haricots verts to the pot and cook three minutes more. If using fresh pasta, both items should go into the boiling water at the same time, since the cooking time for the fresh variety is so short. Once done, drain the pasta and beans, reserving a cup of cooking water as you may need this to smooth out the pesto, then toss with the potatoes and the pesto. And presto — the perfect weekend lunch. Who needs white bean soup anyway? Seriously, there will be plenty of time for that. One final note on the recipe: As you may have noticed, Saveur’s title for this dish indicates it’s made with green beans, while the shopping list specifies haricots verts. Is this a contradiction? The answer is yes, and no. While haricots verts literally means green beans in French, there is a difference between the two, in that the French version tend to be longer, thinner, and to have a more complex flavor than the American. You can often find both at many markets, but if standard green beans (also called string beans or snap beans) are the only kind available, try to pick the thinnest ones possible as these will be the youngest and have the best flavor. And if the fat American variety is all you can locate, that’s fine too — your pasta will still be delicious. Preheat oven to 425. 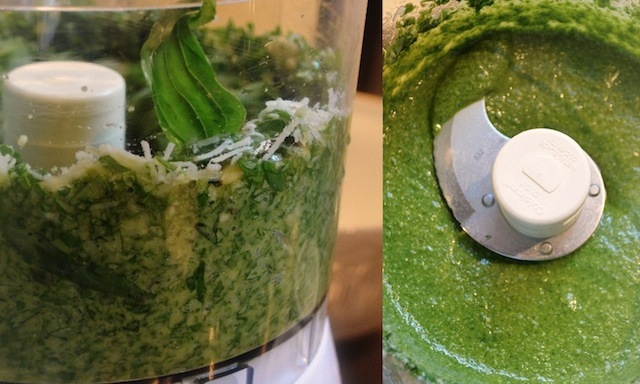 Process basil, ½ cup olive oil, nuts and garlic in a food processor until finely ground. Season with salt and pepper, set aside. Toss 8 oz (1/2 lb) red potatoes with 1 tbsp of the extra-virgin olive oil. Spread in a single layer on a rimmed baking sheet and season with a tsp of coarse salt. Roast in 425-degree oven, stirring halfway through cooking, until tender, about 30 minutes. Let cool, then halve. Bring a 6-qt saucepan of salted water to a boil over high heat; add pasta and cook, stirring, until half-cooked (about 5 minutes for dry pasta). Add haricots verts, and cook, stirring, until pasta is al dente and beans are tender, about three minutes more (note: if using fresh pasta, beans and pasta should be placed in the boiling water simultaneously). Drain pasta and vegetables, reserving ¼ cup cooking water, and transfer to a large bowl along with potatoes and pesto; toss to combine, adding a few tablespoons reserved cooking water, if needed, to make a smooth sauce. 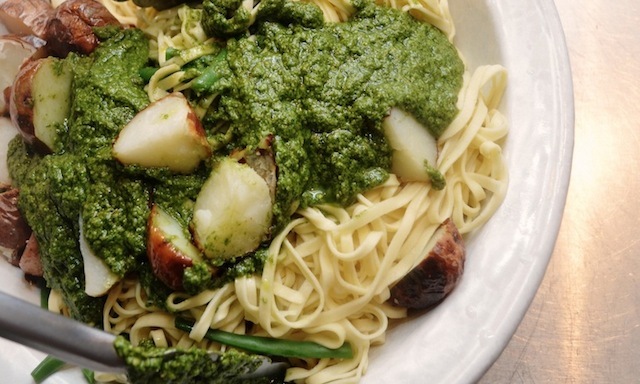 I always have potatoes in my pesto. This recipe looks... perfecto! 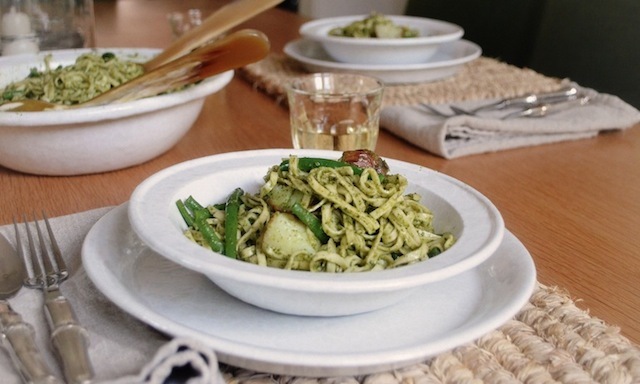 Love pesto alla genovese! Ever tried the Sicilian one? lovely too....with almonds..YUM! as you teach me, I grow my basil!